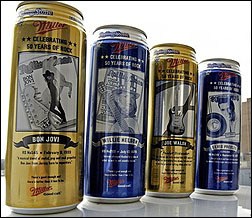 Miller Brewing Company sincerely apologizes to the African-American community, to music fans and to our valued consumers for this occurrence. African Americans obviously have played a formative role in the development of rock 'n roll, and despite our efforts, we did not manage this component of the promotion appropriately. an African-American component titled "The Summer of Non-Stop Hip Hop;"
— A major advertising presence in Rolling Stone's "Immortals," "Moments"
and "Photos" special issues celebrating the history of rock and roll. the most influential African-American artists in these issues. Americans in rock and roll. By making the public fully aware of the breadth of our plan, which does include tributes to black music artists, Miller Brewing Company reaffirms its ongoing commitment to the contributions of African Americans to American culture.